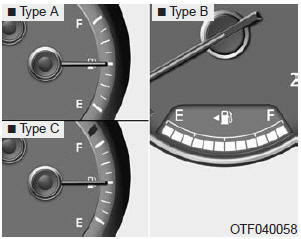 The fuel gauge indicates the approximate amount of fuel remaining in the fuel tank. The fuel tank capacity is given in section 8. The fuel gauge is supplemented by a low fuel warning light, which will illuminate when the fuel tank is nearly empty. Avoid driving with extremely low fuel level. Running out of fuel could cause the engine to misfire, damaging the catalytic converter.